Here's what you need to know about the brand new Bosch Universal Plus - the new improvements are HUGE!!! New Styling: A member of the Porsche design team collaborated with Bosch on this exciting new look. It's fresh and dynamic, and one of the things we like best about it is that it retains the unique "iconographic" shape that has long distinguished the Universal from lesser machines. We think it's a big winner. Enhanced durability: It's surprising to be talking about a "more durable" Universal, considering that they've already seemed to last like Methuselah compared to other mixers. But accelerated load testing by Bosch shows that the motor of the Universal Plus will now last four times longer than in the past, and the transmission will last twice as long as the one in the former Universal under heavy kitchen use (the kind of use most Bosch users give their machines.) Universals have been lasting 15-20 years... multiply that times two and we seem to be looking at a machine with a drive train that virtually cannot be worn out. The extra years of life that Bosch has engineered into this machine much more than make up for its additional cost. Easy Cleanup: The drive shaft is removable!! In two seconds you can pop the drive shaft assembly out the bottom of the bowl! This is a big boon to cleanup on those occasions when dough gets into the center column. Higher Performance: The motor has been boosted from an already-strong 700 watts, up to 800 watts, but its power output has been increased even more than the 100 watt difference would seem to indicate, because it has a more efficient design. Remember, wattage really is not an absolute measure of power -- it's a measure of electric consumption. This 800 watt motor is more powerful than most motors with considerably higher wattage ratings. More Speed Choices... Plus a wider speed range. This machine has four speeds (plus pulse), rather than three speeds. And it has a slower Speed 1, and a higher top speed. Higher Capacity: The rated bowl capacity is 6.5 quarts. We'd call that its "air" capacity, and we'll probably describe it online as 5.5 quarts usable capacity. A more practical measure is that we've rated the old bowl at 12 lbs. of dough, and this one should hold 15 lbs. because its lid has much better "crown" than the old one. Also, the splash ring has four locking tabs rather than three, and it has a "holding" tab that keeps the splash ring from wiggling loose. New Blender: A new blender design incorporates the superior performance of the old blender, and now includes a lid safety lockout that prevents operation of the motor unless the blender lid is installed. The lid funnel is much larger, allowing big ice cubes to be added with the lid in place. When the blender is not installed, the safety cap must be installed over the high speed drive or the motor will not run. Same Accessories Fit: Your customers' old accessories will fit onto the Universal Plus. That goes for both the bowl attachment drive, and the blender attachment drive. So they can upgrade to the Universal Plus, and not have to replace any of their accessories. Dishwasher-Safe Whip Drive: The new whip drive cap is plastic, rather than aluminum. The whip axles are still stainless and are now molded into the drive cap, so they won't pull out as could sometimes happen in the past. Washing the old aluminum version in a dishwasher would turn it dark gray very quickly, but that won't happen to the new one on the Universal Plus. I am really excited about the new Bosch Universal Plus and I believe that you will be too. I've made over 10,000 loaves of bread since 1980 and I want you to be successful with your first batch. We are not a big company with an automated answering service staffed by sales people who don't bake bread. You talk to me and I can answer your questions. I am not far from my kitchen phone - (320) 286-2865. 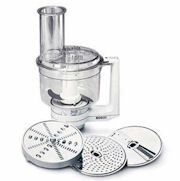 The manufacturer's suggested price for the Universal Plus w/o blender is $479.99. We have the lowest price available online. Read the Universal Plus manual in PDF format. Our low price: $464.97 - White color - MUM6N - with Cookie Paddles with metal whip drive - with Bowl Scraper - w/o Blender - Free shipping in the continental United States. *Minnesota residents need to pay 6.875% sales tax also. Our low price: $469.98 - White color - MUM6N - with blender - Free shipping in the continental United States. Our low price: $399.99* - White color - MUM6N - w/o blender - Free shipping in the continental United States. New Style Blender Only for the Universal Plus - MUZ6MX3 - This versitile blender is only $69.99 plus $8 shipping if ordered seperately from the mixer. The design of the blender prevents the motor base from starting unless the blender is firmly locked in place. This blender also fits the older style Bosch Universal blender. Shipping $8 in continental United States. Cookie Paddles for the Universal Plus and Metal Whip Drive- Type MUZ6CP2. 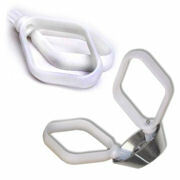 The wire whip works for pourable batters and the dough hook for heavy cookie doughs, but now you have another option. These sturdy paddles work with medium cookie doughs. These drop onto the Universal's drive shaft with the included metal drive piece — that's the oval-cone shaped part in the photo. Warranted against defect by the manufacturer for one year. This is a very useful accessory, highly recommended! MSRP - $34.99. Shipping $8 in continental United States. Sarah shows off the Bosch Universal Plus mixer. She makes six loaves of tasty whole wheat bread using the recipe below in one hour and fifteen minutes. If you have a slow internet connection or you're having trouble watching, you can try downloading the video file here. NOTE: You have to click the bar at the top of your browser which says, "Allow the ActiveX Component to run?" This is the video player and clicking the bar will start the video. Download Sarah's Best Bread Recipe. Please watch the whole video shown above for step-by-step instructions and tips for making this tasty whole wheat bread that you and your family will enjoy. Here's a letter from Kay who lives so far out in the country, the UPS people couldn't find her house to deliver her Bosch Universal. 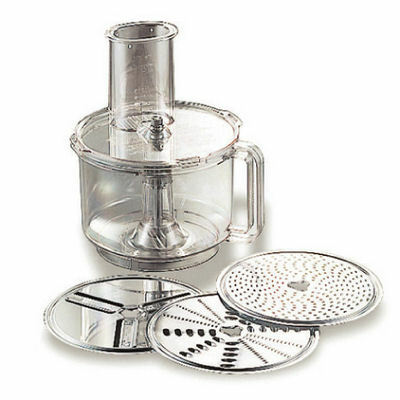 I just want to thank you for all of the assistance you gave me in tracking down my dough mixer. I have received it and last night made my first batch of bread using Sarah's recipe. It turned out wonderful and is so much easier than making bread the old fashion way. I had some concerns about bread using only whole wheat flour but will never have that worry again. The bread is moist and is the size of a loaf of white bread. Using a bread machine I always had a loaf of whole wheat bread that was heavy and small. I am the lady who bought your used Bosch mixer. I also ordered the nutrimill. I am extremely pleased with both. Although this was a big investment for our one income family, I know we will get many years use out of these products. I want to thank your for your wonderful customer service and timely shipping. 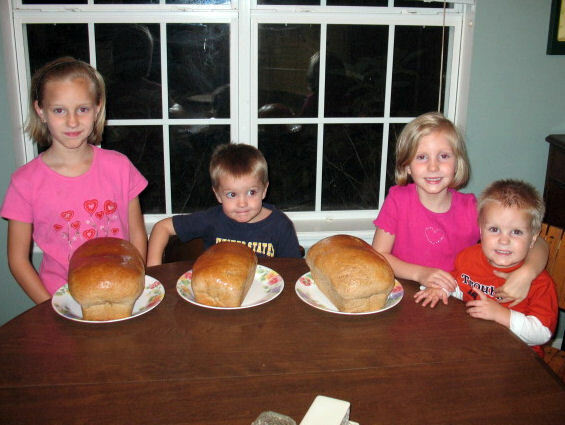 Also wanted to let you know we baked our first batch of bread last night. My 4 children enjoyed helping very much. I did omit the whey powder as my youngest son has milk allergies. And the bread still turned out wonderfully. My husband is overseas serving in Iraq right now so it was a nice surprise when my 4 year old son said. "Mommy this bread is sooooo Yummy, that it helps me not miss Daddy so much!" Thank you for a great Bread Baking experience! The first time I baked whole wheat bread, it strongly resembled a brick. My children thought this was hilariously funny and we used it for a DOOR STOP. I was not laughing. I worked on it and began to perfect the recipe. Two years later, I was making and selling whole wheat bread and people were standing in line to get it! The solution was my all time best and utmost favorite kitchen tool - my BOSCH. It is a most excellent all purpose mixer that does everything. What holds it dear to my heart is the DOUGH HOOK. This little beauty can knead six-loaves of bread in 10 minutes - thus allowing me to do many loaves of bread quickly. From the time I grind the wheat - to the time when I take six-loaves of whole wheat bread out of my oven is one hour and fifteen minutes. Eighteen loaves in three hours! Stick it in the freezer and you can have fresh bread every day. This is not a bread machine - this is a BOSCH! A picture is worth 1000 words - so here is me and my Bosch making bread. The Bosch Universal comes with a heavy-duty motor base, dough hook, French whip mixers, bowl with cover and a blender. I have been baking whole wheat bread with my Bosch mixer since 1980 - long enough to show the effects of good nutrition and health in our family's wellness. It has also provided a lucrative part time job that helped to pay college expenses and to buy Christmas gifts. For a stay at home mom, this might be the solution to raise extra money. I had used my first Bosch mixer for about eleven years and it was taken when my car was stolen in Dallas. (Yet another reason to move from the big city.) I had used it my bread business and had made over 12,000 loaves of bread with it. It was in great shape and good for another 12,000 except I never got it back. My second one I used for about ten years and I sold it. My third one is three years old and like new. The Bosch Universal is the only mixer that will hold up kneading whole wheat bread (Unless you want to buy a commercial quality Hobart mixer on Ebay). MY BOSCH BLENDER GETS IT DONE! We are blessed with beautiful, big apple trees. This results in apple sauce, apple pie, dehydrated apples, apple crisp, and apples in Bob’s lunch box. I discovered years ago, that there is a simple and fast way to make a LOT of apple sauce. No peeling, no chopping, and no cooking. Wash and core your apples. (Do not peel). Fill the BOSCH BLENDER ¾ full with cored apples. Start your BOSCH BLENDER on low and gradually increase the speed to medium. Blend for about 1 minute. Pour the blended apples into a large container. Fill your BOSCH BLENDER ½ full of more cored apples. Add 1/8 cup water. Repeat blending directions. Mix second batch of apples with the first batch. Stir by hand until blended. Pour into Freezer bags, label and freeze. That’s all there is to it. I process a LOT of apple sauce by using this simple recipe. When ready to use, thaw the apple sauce. It is good!